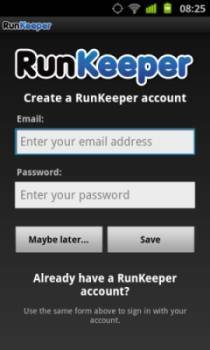 Having reviewed Runkeeper recently I wondered if there were any other offerings in the Android Market that would help me track and manage my activities. Â It seems there are. Â One of the most popular being Endomondo. I will admit to having used Endomondo a few times at the start of this year and I found it a good all round app. Â It has all the hallmarks of a well put together app, a great website that syncs your data from your phone, plus a great community feel that helps and encourages you to do well. Â The application is available for both iOS and Android obviously this review related to the Android version. Setting up the app is very straighforward. Â Opening an account is quick and easy and you will be up and running in noÂ time, pardon the pun. Â To track calories more accurately you can enter some information about yourself such as Gender Â and Weight. Â You can also set up the tracking options here, you can choose from Miles or Kilometres depending what Â side of the pond you are located. Â There is also Facebook Integration that will automatically sync your workout to Â Facebook if thats your thing. There are also a whole host of other options that are available such as Audio Cue's, type of activity i.e.. running, cycling etc. Â The addition of an auto pause function is a real winner for me, most of the other activity trackers I have tried failed to offer this very worthwhile feature, it's especially handy when you have to stop to cross the road and the like. The user interface if I am honest looks a little cheap and nasty to me, however from a functional standpoint it ticks all the right boxes. Â Its clear and easy to read even when your running or cycling down the road, the stop and pause buttons equally as easy to find when needed. Â You also have the option of setting a goal from the main screen. Â This is an awesome addition. Â You can simply set a time, distance or calorie goal to get you started. Â However it gets very clever when you can compete against friends that you have connected with via Endomondo or Facebook over the same route's, times or distance.. Â This really creates a competitive community and this will encourage better and better times as you train. The screen also gives an instant indication of time, distance, calories and a real time pace. Â Additionally you can goto your music app and create playlists for use when running.Â There is also a whole host ofcompatible gear available ranging from HRM to Headphones to Cadence sensors. Â This app will connect to these and then sync the data to the Endomondo website along with your activity. When your run is complete, as mentioned earlier you have the option to sync to the website, however you can also view and digest information about your run right there from your phone. Â You can view the map, along with satellite view if thats what your into. Â The big one for me is that you can view your run on k by k basis breaking down the time for each kilometre or mile ran. Â This is perfect for checking your consistency over a longer run. Over to the website, what can I say. Â Awesome. Â It offers challenges, stat breakdowns, social integration with Facebook and Twitter as well as a whole host of routes throughout the world that you can download to your phone and run for yourself. Â Ever goto a new city on business and not sure where to run, you do know its just such a brilliant idea. Out of the activity trackers I have reviewed so far I think that Endomondo wins due to the website and its fabulous integration. Â The outstanding community feel is just a huge draw for me and I am sure many others will agree. Â The compatibility with so many 3rd party accessories is also a great plus. The battery use on this app is also very good, over a 8km run lasting 40 minutes with voice prompts on it used just 6% battery, again this was with me checking progress on a very regular basis. Â I am sure we could get this app to last a 4 hour marathon without to much trouble. This review was conducted on a Samsung Galaxy S2 with a custom Cognition 1.5 ROM I have also used this app on a HTC desire and found similar results with battery drain so again we have ourself a very well coded application. [app]com.endomondo.android[/app] Also available from Endomondo is Endomondo Pro, this has various extra's included for a small fee. Â If you enjoy the app please consider supporting the developer PRO features â€¢Calorie goal: Set a calorie goal and get live audio feedback during you workout. â€¢Beat yourself: Set a previous workout as your target and the audio coach will help you perform better this time â€¢Time goal: Set a time goal and let the audio coach help you reach it â€¢Low Power Mode: Increases battery standby time [app]com.endomondo.android.pro[/app] [nggallery id=11] .